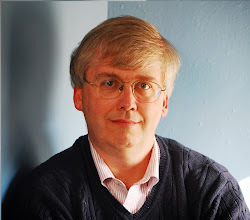 CONVERSABLE ECONOMIST: How Well Do U.S. Students Read? In the Fall 2012 issue of Future of Children, Sean F. Reardon, Rachel A. Valentino, and Kenneth A. Shores consider "Patterns of Literacy among U.S. Students." Of course, "literacy" is a somewhat elastic term, ranging from the most basic functional literacy that lets a person handle day-to-day tasks like reading a map or a drive-through menu, up to the ability to read more complex and specialized texts with comprehension of strengths and weaknesses. 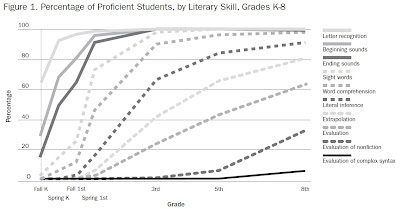 Here's a figure showing various dimensions of literacy and how U.S. children are performing. Nearly all children manage the basics like letter recognition, and beginning and ending sounds, by second grade. But even by 8th grade, a large share of students have real problems with being able to real well enough to evaluate text, especially when faced with nonfiction or with complex syntax. 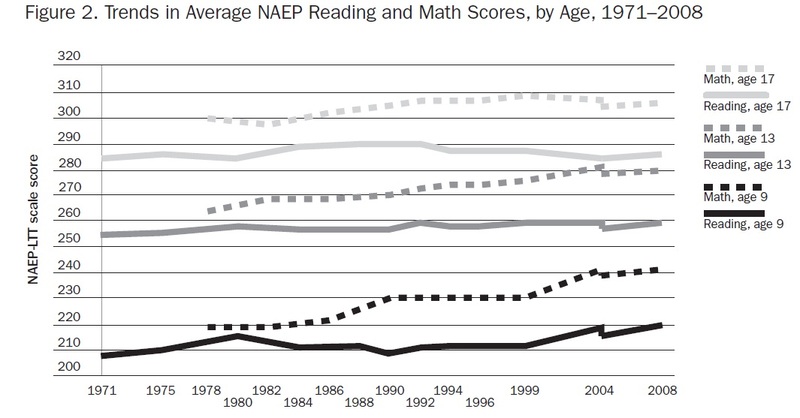 What are the trends in literacy over time? Performance hasn't changed much. 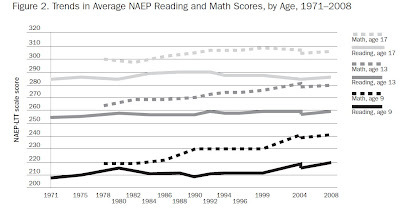 Here's a figure showing reading and math test scores on the National Assessment of Educational Progress (NAEP) tests, from 1971 to 2008. There appears to be a bit of rise for 9 year-old readers in recent years, but at least so far, that hasn't translated to higher reading scores for 13 or 17 year-olds. 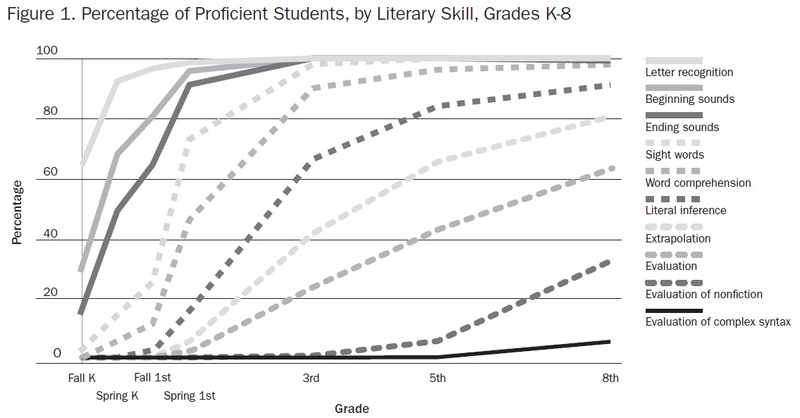 How does the literacy of U.S. students stack up against those in other high-income countries? "On international comparisons, American students perform modestly above average compared with those in other OECD countries, and well above average among the larger set of countries for which the PIRLS [Progress in International Reading Literacy Study] and PISA [Programme for International Student Assessment] studies provide comparative data. Moreover, there is no evidence that U.S. students lose ground relative to those in other countries during the middle-school years. literacy assessments is in stark contrast to the poor relative performance of U.S. students on internationally administered math and science assessments." And with that comment the authors touch on a point that nags at me from time to time. Literacy sounds like a doesn't always get the attention of STEM education: that is, science, technology, engineering, and mathematics. Literacy lacks a cute acronym. It's a softer subject in some ways: teaching about deeper levels of comprehension can't be as black-and-white as balancing a chemical formula or solving a geometry problem. As the authors suggest at various points, the curriculum pathway to teaching literacy and spoken skills after the most basic level is less clear-cut. States relies increasingly on the literacy skills of the labor force. Finally, in an information-rich age, thoughtful participation in democratic processes requires citizens who can read, interpret, and evaluate a multitude of often-conflicting information and opinions regarding social and political choices."